I have a bit of fear of the blank page. 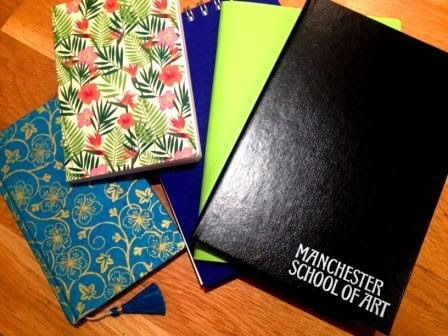 I love buying pretty notebooks and sketchpads with bright, colourful patterns on them, but for some reason they always seem to get left on the shelf and not used. I think its because I have a fear that the sketches and notes I put inside them won't be as good as their covers. Maybe I should stop buying such intimidating notebooks. I think this must be on my mind at the moment because, for whatever reason, I've managed to bring it up in conversation with at three individual moments throughout today. I think it's to do with my concern about not being creative enough to do my course justice. In one of our Anticipating Change discussions, my collegue James mentioned a quote he'd heard about creativity - we are all born creative but sometimes education can teach it out of us. I feel like my Mechanical Engineering undergrad may have done this to me a bit. As engineers, we are taught to look very closely at design; we specialise early; we are pigeon-holed into one area and then go into industry to work in cubical working on one specific topic for our career. I feel like that was one of the reasons why engineering wasn't necessarily right for me, and actually I disagree that it is taught that way. The boundaries between science and art are becoming more and more blurred, with collaborations in all sorts of areas, and yet the two worlds never really collide. They are kept separate despite the fact that when they do work together, amazing things happen, and that's a real shame. Being the only one with a traditional science background on my course means that although I can tell you about best practices to manufacture things, and the science behind how things work, I really struggle with creative processes. At times I have worried if my creative spark has been snuffed out by four years of maths and physics. Or perhaps the spark just needs to be fanned and then my creativity will ignite again and burn bright like it did when I was younger and used to dream of all the things I could invent. Speaking to my collegues and one of my lecturers about this earlier (though not in such poetic language), I decided that this is entirely in my hands - the more work I put in to producing designs, the more I will develop and get out of the course. I have been told about some design exercises I could do to help start get my creative juices going again and I am really going to throw myself into this. This is my chance to do what I've always wanted to do and I'm not going to waste it.